Scooper - Technology News: When will our kids walk to school again? When will our kids walk to school again? 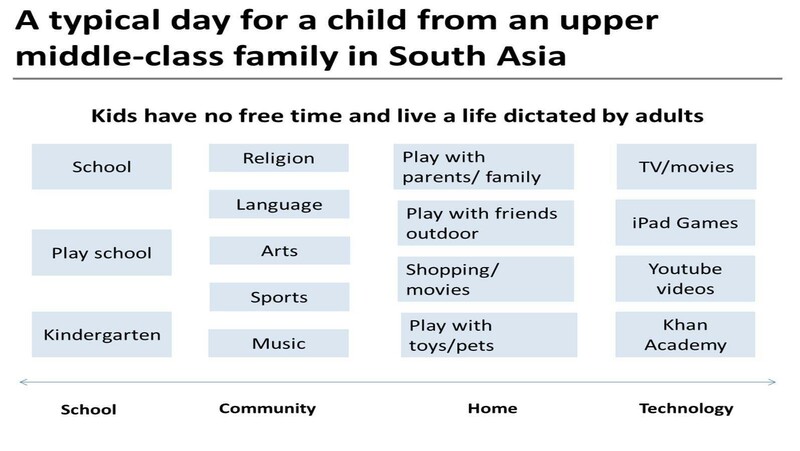 Recently, I ran a mini-survey with my friends in South Asia asking what a 24-hour day looked like for their children. A synthesis of the various daily activities showed that the child has little time to be just “free”. The parents tell them when they have to get up, when they have to sleep, when they can watch TV, when they can play, and so on. As someone who grew up in India in the 1980s, in a small city, I see a big difference between the India I knew then and the India we see today. There are massive and well-built airports and shopping complexes, high-quality roads and many more cars. But there are also some staggering side effects of this rapid urbanization. There is massive pollution in our cities, less safety for our children and our basic needs in life have become so expensive to answer: clean air, drinkable water and safe public spaces. While I was growing up, I used to roam freely with my friends around the neighbourhood; on holidays, we used to play cricket from dawn to dusk far away from our homes. My mother would frequently send us to buy groceries from the shops and we used to drink water from the well in the house. There were fewer cars in the road, fewer gadgets and only three hours of state-run television, but we had what we needed and it was ours for free. I compare this with the life my kids had in Bangalore. We lived in a premium apartment complex and it had all the amenities. We had lot of gadgets, a car, computer games, iPad, television and DVD player. But my kids could never be sent alone to the grocery shop nearby, they could never go out of the gated community or mingle with kids from different backgrounds – and, most importantly, they could not breathe clean air or drink clean water. I was comparing my childhood in Madurai with my kids’ early childhood in Bangalore. Now they are growing up in Geneva. In Switzerland, my kids are experiencing a childhood similar to mine. I made the below comparison between our lifestyles and, to me, Madurai life in 1980 and the life we live now in Geneva are very similar. It is the Bangalore life that is out of place, and this life is imposed by adults on kids. Our cities neither provide the inspiration for kids to unleash their creativity nor bring the curiosity out of our children to keep them as lifelong learners. Lots of kids complain about boredom when they are under 10 years old. There is less physical activity and more time spent with gadgets. The cost of not addressing this issue is going to be enormous in the future – socially, politically and economically. A scene from the award-winning Tamil film Kaaka Muttai , in which a kid from a wealthy gated community interacts with two kids from the slums, presents the state of affairs for children in India. The fence between the two groups of children depicts the sharp contrast between the two different socio-economic groups. Kids from wealthier communities live in a world rigidly organized by adults: they can't play or socialize freely with their peers. Kids from low-income communities enjoy lot of freedom but face the dangers of the street and extremely polluted neighbourhoods. There is a paradox here: “freedom at the cost of safety and caring” versus “safety and caring at the cost of freedom”. How might we break free of these fences and reimagine our cities to help kids experience a world that feeds their curiosity, learning and creativity? When school children walk in our streets without fear – that will be the demonstration of our development and our commitment to building a developed nation. Will our governments and leaders work towards realizing this simple challenge? It would be great to celebrate our kids walking in a parade to school in the same way that we celebrate our Republic Day parades.